Ear infections can cause your baby or child to not want to lay down flat. Many young babies and toddlers with ear infections refused to be put down at all. I remember my daughter would want to be held and walked around. I couldn’t even stand still! Eczema can cause scratching that keeps a baby or child up and can be worsened by certain fabrics like sheets and the heat from being under blankets. Seasonal allergies like hay fever can cause sinus congestion that makes it difficult to breathe, snoring, and even sleep apnea, which is when your baby or child stops breathing for a short time during sleep. Food sensitives or allergies, especially a milk protein allergy, can cause pain and potty accidents problems at night. Did this change in sleep happen suddenly or has your baby or child had a history of sleep problems? If your child has a history of poor sleep habits, this could be a worsening of the problem. If your child was a great sleeper and the change seemed to appear overnight, it’s more likely to be an illness. Has your baby or child shown any signs of a brewing illness, like a runny nose, a change in appetite, or clinginess? Some illnesses come on quickly but many illnesses start off with some tell-tale signs. A baby with a stomach bug might refuse to nurse and a toddler might push away his food. An ear infection often starts with a cold with a runny nose. What has your baby or child’s demeanor been like during the day? 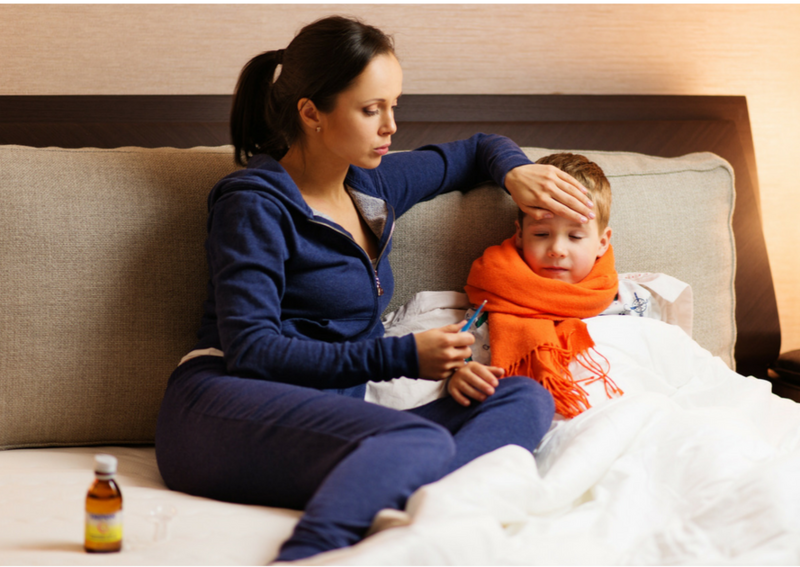 While it’s true that most symptoms feel worse as the day progresses into the night, a baby or child who is sick will likely show some signs during the day as well. If he’s chipper and full of energy during the day, but waking you up all night, it’s less likely (although not impossible) to be an illness. Leaving a baby or child to cry at night or naps if he is in discomfort is only going to make sleep and illness worse. Even though you might be scared to create sleep regression, it’s important to first meet the needs of your baby or child. Be sure to get your baby or child the proper diagnosis and medical care he needs to feel better, such an antibiotics for bacterial infection (they don’t work for viruses) and allergy treatments for allergies. Your baby or child’s doctor will let you know what home care you should use, such as over the counter medicines, increased fluid intake, and rest. Your job is to meet the need for comfort and address symptoms, even if it means that you get little sleep. While you shouldn’t worry too much about creating bad habits, you can be mindful about what strategies you use to comfort. Try soothing with the least amount of change to the routine as possible first, and increase at a pace that feels right for your baby or child’s symptoms and is in line with your parenting philosophy. For example, if you normally don’t bring your baby or child into your bed with you, don’t try that as your first approach. Maybe your child will be comforted enough by rubbing his back during wakings or by having you camp out on a mattress on his floor. But if push comes to shove and you and your child are miserable, do whatever you need to do to safely comfort. You can always get back on track when your child is feeling better. It’s not providing more comfort when sick that creates a long-standing sleep regression, it’s allowing the extra comforting and change in rules to continue long afterwards. If you get back to your sleep expectations and rules as soon as your child is feeling better, a sleep regression can be prevented. They learn quickly that when they are sick, you are there to comfort them, but when they are well, the expectations hold. So, if you want to be able to provide that extra comfort when your baby or child is sick without the anxiety that it’ll cause a sleep regression, be consistent about getting back on track!